Opinion analysis: Internet threats still in legal limbo? The Supreme Court moved into the new realm of violent speech on the Internet with the aim of clarifying the legal risk. It insisted Monday that it had done so, at least part of the way, but two Justices argued that instead only confusion had resulted. It is not even clear, at this point, what happens next to the man at the center of the case: Anthony Douglas Elonis, a former amusement park worker from Pennsylvania’s Lehigh Valley. Future prosecutions under the 1939 law prohibiting the communication of threats — including cases, like this one, involving digital-age expression — no doubt will move forward. But they likely will be surrounded by questions left unanswered by the decision. Such questions include what evidence prosecutors must offer, and what impact, if any, the First Amendment guarantee of free speech would have. Anthony Elonis’s conviction for violating the threats law was explicitly overturned with the support of eight Justices; only Justice Clarence Thomas would have upheld the guilty verdict at this point. 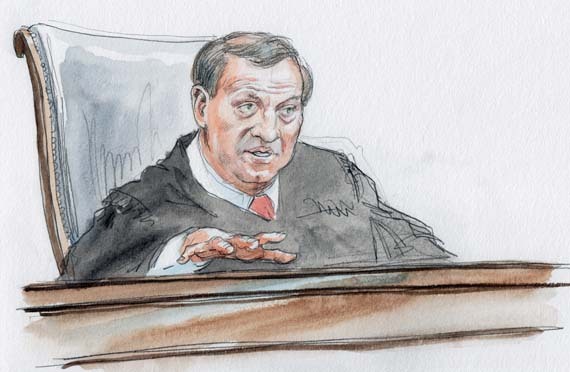 However, only seven Justices backed the majority opinion, because Justice Samuel A. Alito, Jr., would have reversed the verdict but also argued that it could have been upheld on another theory. That alternative theory is that a person is guilty of making a threat by the Internet (or other communications) if the violent words were uttered recklessly — that is, knowing that he was taking a legal risk, but disregarding it. The main opinion in Elonis’s favor, written by Chief Justice John G. Roberts, Jr., did not endorse that theory and in fact did not decide it, on the ground that it was not actually an issue in the appeal. Another issue left unanswered by the Roberts opinion was whether the threats law, when applied to speech along the lines of Elonis’s postings, would violate the First Amendment’s protection of free speech. Although Elonis’s lawyers made that claim, the Court did not decide it. Rather, the ruling overturning his conviction was based solely on the premise that he was convicted without proof that he knew what he was writing and that the ordinary meaning of his words would be a threat. The 1939 law at issue, the Chief Justice wrote, “requires that a communication was transmitted,” “that it contained a threat,” and that the accused individual knew that. At Elonis’s trial, the jury was told that it could convict him — and it did — with proof that what he wrote in his posts would be understood by “a reasonable person” as a threat to his estranged wife and to others who were the targets of his Internet messages, conveyed via Facebook. A jury found Elonis guilty of violating that legal standard not only with his comments about his wife (including a desire to kill her), but also when he wrote about blowing up police officers with explosives, shooting the children in a kindergarten class, and cutting the throat of a female FBI agents who came to his house to investigate. The jury found him not guilty of only a comment about harming co-workers at the amusement park where he had worked. Throughout his prosecution, Elonis and his lawyers insisted that he was only exercising his First Amendment rights and that he was acting out his total despair, in a “therapeutic” way, after his wife had left him, taking their two children with her. In the Supreme Court, he argued that he could be convicted under the 1939 threats law only if prosecutors convinced a jury that he had specifically intended to actually harm each of his targets on Facebook. The federal government countered that it was enough, for conviction under that law, if prosecutors showed that the threat was made, without regard to what the individual was thinking at the time. Thus, the opinion concluded, it is not enough for prosecutors to show mere negligence — that is, a failure by the accused who had some awareness of a legal risk, and did not hold back from that. It is a long tradition in American criminal law, Roberts wrote, that negligence is insufficient to show guilt for a crime. Justice Alito went along with that part of the ruling and the Chief Justice’s opinion, as did Justices Stephen G. Breyer, Ruth Bader Ginsburg, Elena Kagan, Anthony M. Kennedy, Antonin Scalia, and Sonia Sotomayor. In his opinion concurring in part and dissenting in part, Alito wrote that someone who did what Elonis was accused of doing should also be subject to conviction on a less-demanding standard than negligence — that is, mere recklessness. The Court obviously had difficulty in working out its final opinions in the case. It was argued on December 1, and as of Monday was the second-oldest case still pending this Term. Only a major constitutional case on government powers over passports remains undecided from one of the Court’s earliest sittings this Term — the Zivotofsky v. Kerry case, argued in early November.